Steve Burgess recalls his father, James R. Burgess Jr. Courtesy of Champaign County Historical Archives,The Urbana Free Library. 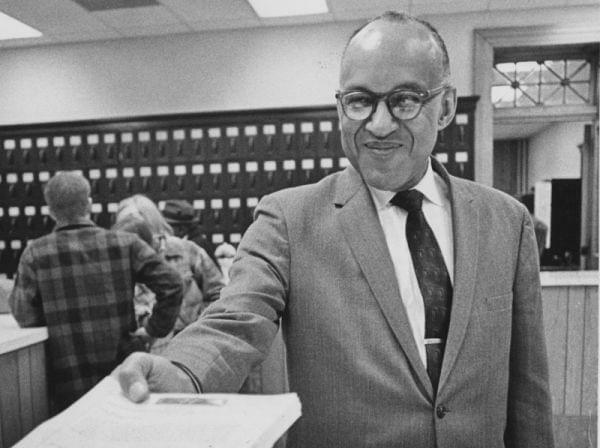 Steve Burgess reveals his journey of discovery about his father, James R. Burgess, pictured, Champaign County's first African American State's Attorney. Steve learned about his father's role in World War II after his father died. James Burgess was a first lieutenant commanding one of six African American tank companies in the famous 761st Tank Battalion that served under General George Patton, including at the Battle of the Bulge. Steve Burgess talks about his father's battle experiences, as well as the racism he and other black soldiers faced as they trained in the Deep South. He says his father never talked about the war. "My dad was a complicated person. I guess you would say he went through his whole life never looking back. He was always looking forward on what to accomplish next," he said. Steve also discusses his efforts to pass legislation that would name a federal building in memory of his father, who was appointed by President Jimmy Carter as the U.S. Attorney for the Eastern District of Illinois.